London Biotopes is a work that investigates future biological interactions with the city. The increasing understanding of our DNA and the rise of bio-technologies will fundamentally change the way we interact with each other and our environment. Today, DNA is a tool for identification, you can have your DNA analysed over the internet and we are creating new types of bacteria by reprogramming their DNA. But what does this mean for tomorrow? Will we have DNA-surveillance and discrimination? Bio-identities and communities? And what will our new interactions look and feel like? A first intervention in this project focussed on Thames Water; London's largest 'drinking water and wastewater service company'. 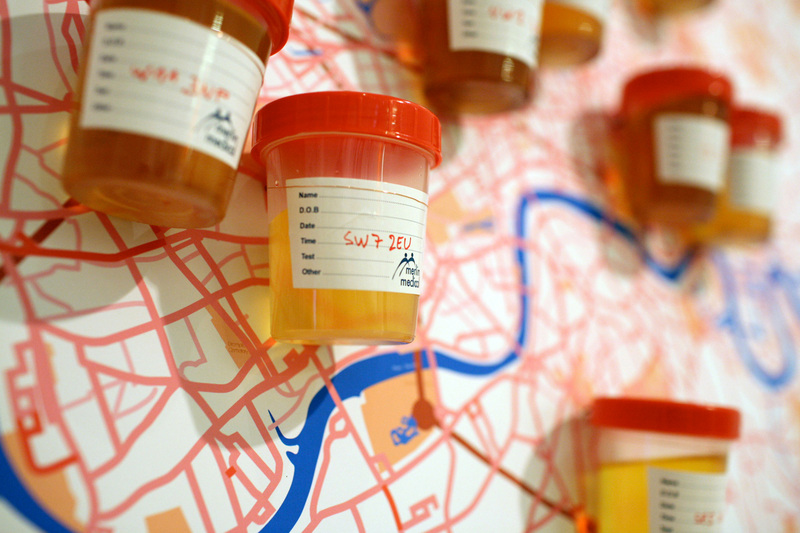 At the Design Interactions work-in-progress-show, visitors were offered tap water (kindly provided by Thames Water) and were asked to donate a urine sample along with their postcode. The samples were attached to a large map of London, essentially adding a layer of biological information to the map. A second intervention was looked at pharmaceutical pollution: Only a small amount of the pharmaceuticals and chemicals we swallow are taken up in our bloodstream, most of them pass through our bodies into the city's wastewater. Since wastewater treatment plants are not designed to remove pharmaceuticals, the contents of our medicine cabinets eventually end up in the drinking water. This results in local differences in tap water, based on the food we eat and the drugs we take. Tap water from three different areas was bottled: in the City of London, tap water is more likely to be enhanced with various stimulants because of the high-performing financial industry. In Notting Hill on the other hand, the tap water benefits from the highest density of organic shops so would be free of any artificial additives. Golders Green, a very religious (mostly Orthodox Jewish) area in the north of London 'produces' a very fertile water with low concentrations of oestrogen due to very few people taking anti-conception pills. This branded tap water was then sold on a sunny Saturday morning on Broadway market and people were asked to also put their tap water on the map, speculating its special qualities. 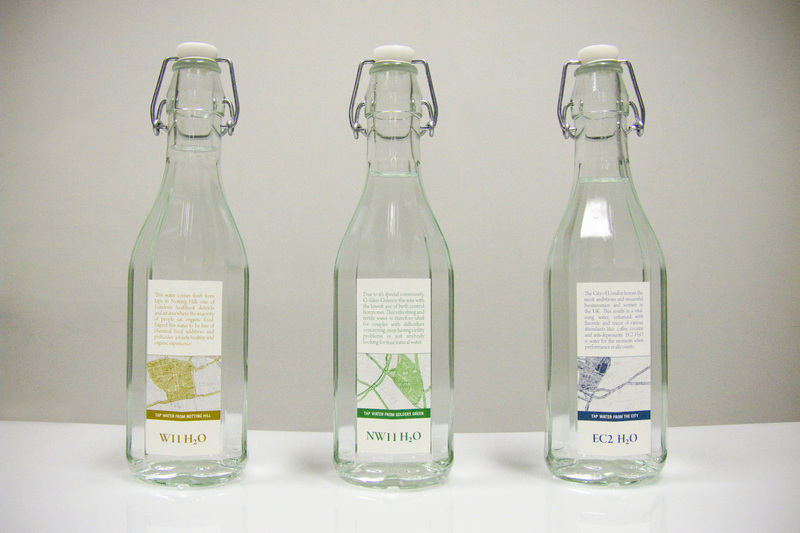 On the project website too, people could add stories about their tap water to the map. People in Chelsea, for example, expected their tap water to contain high levels of anti-depressants. 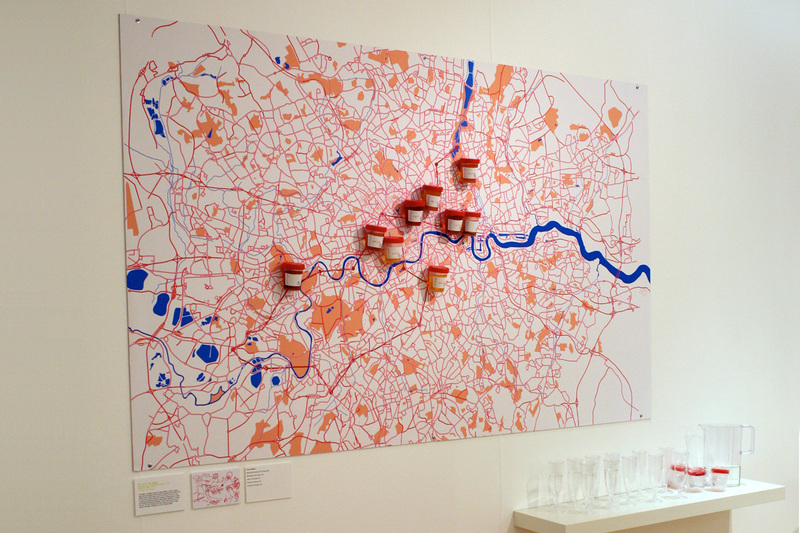 The result is a new map of London, revealing potential local city-body ecologies or biotopes.